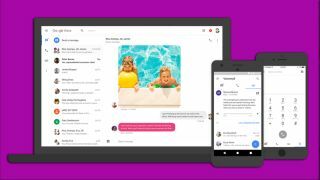 Google's one-number-many-devices communications solution Google Voice is well overdue for some attention - it's been five years since its last major update. After teasing changes to come two weeks ago, Voice's wish was just granted: rolling out now is its first major update in a long while, complete with new features and a fresher look. Heading to iOS, Android, and the web starting today, the biggest change to the updated Google Voice is more convenient message browsing, with easy-to-search tabs containing your texts, voicemails, and call history. Other improvements include allowing group chat and photo sharing over MMS, as well as replying within a notification tab when using another application - two features we've come to expect in a modern messaging app, and are certainly welcome here. The newly added voicemail tab also gets a novel addition designed for Spanish speakers, as Google Voice expands its voicemail transcription abilities to include the language, and promises to continue improving its accuracy over time. Google Voice has more or less found itself competing with Google's other service, Hangouts, for internet-based calling. In fact, Google Voice users can even receive calls through the Hangouts app. Google adds that while users don't have to change apps following Voice's new update, they may still "want to try them out" to see if the changes call out to them as the new Google Voice rolls out over the next few weeks.